Now that September has rolled around again, it can mean only one thing: back to school! In the excitement of meeting new teachers, getting back on the school schedule, carpools, and buses to catch, it is also a great time to help kids prevent bullying. 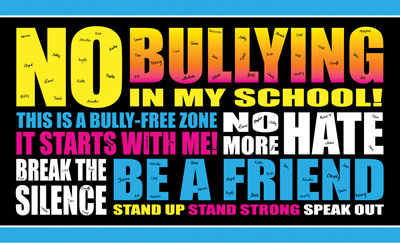 Each day more than 160,000 U.S. children stay home from school because they fear being bullied. Kids were once asked to accept and endure this treatment. But no longer. Children and adults are now taking a stand during National Bullying Prevention Month to end this form of harassment. Most of today’s parents and educators grew up in a different world when it comes to bullying. Now, in addition to physical, emotional, and verbal attacks, cyber bullying has spread to the Web and social media. Sexual bullying — which includes harassment related to gender and orientation, or inappropriate contact — is becoming an increasing problem. Be their friend: Children can help someone who’s been bullied by simply being nice to them at another time. Being friendly can go a long way toward letting them know that they’re not alone. Tell a trusted adult: An adult can help stop bullying by intervening while it’s in progress, stopping it from occurring or simply giving the person being bullied a shoulder to lean on. Help them get away: There are a few simple, safe ways children can help the person being bullied get away from the situation. However they do it, make sure the child knows not to put themselves in harm’s way. Don’t give bullying an audience: If a child knows not to bully others, then other students will follow their example. To help even more, children can actively participate in anti-bullying activities and projects. Set a good example: If one of your child’s friends or peers begins to bully someone, they shouldn’t encourage the behavior by giving it an audience. Instead of laughing or supporting it, they can let the bully know that such behavior isn’t entertaining. You must pre-register for this event! or, even better, check our schedule and come on by! Come to class a few minutes early and you can participate the same day! We’re located conveniently in Park West Village (the Target shopping center) at 1408 Village Market Place Morrisville, NC 27560. This entry was posted in Blog, News and tagged Balance Martial Arts, Bully Prevention, free kids activities, free martial arts workshop, Help with Bullying, International Bully Awareness Month, karate cary, karate morrisville, kids karate cary, kids karate morrisville. Bookmark the permalink.